But the overwhelming majority of government leaders remain male. Women’s representation in political decision-making continues to rise slowly, with slight improvements since 2017, according to the data presented in the 2019 edition of the biennial IPU-UN Women’s map of Women in Politics. The map was launched during the Commission on the Status of Women (CSW63) held at the United Nations offices in New York last month. The IPU (Inter-Parliamentary Union) is a global organisation of national parliaments which works with parliaments ‘to safeguard peace and drive positive democratic change through political dialogue and concrete action’. The map, which presents global rankings for women in the executive and parliamentary government branches as of 1 January 2019, shows that the proportion of women ministers is at an all-time high at 20.7 per cent or 812 out of 3922 – which is 2.4 percentage points higher than in 2017. It also shows that the types of portfolios women ministers hold are diversifying. 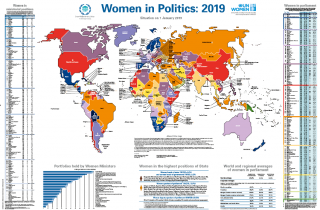 The map follows the publication last month of the IPU’s analysis of women in parliament in 2018 which showed that the global share of women MPs – 24.3 per cent – has increased by nearly one point compared to 2017. The share of women parliamentary speakers also increased by 0.6 percentage points to 19.7 per cent, and the share of women deputy speakers increased by 1.6 percentage points to 28.2 per cent. There are however, three more gender-balanced governments. Nine countries, up from 6 in 2017, have 50 per cent or more women in ministerial positions: Spain 64.7 per cent; Nicaragua; 55.6 per cent; Sweden: 54.4 per cent; Albania: 53.3 per cent; Colombia 52.9 per cent; Costa Rica: 51.9 per cent; Rwanda: 51.9 per cent; Canada: 50 per cent; and France: 50 per cent. Ethiopia saw the largest increase in women’s political representation in the executive, comparatively, from 10 per cent women ministers in 2017 to 47.6 per cent in 2019. Pakistan progressed from having no women ministers since 2012 to reaching its highest-ever share of women ministers – at 12 per cent. In the Middle East and North Africa, Mauritania maintained the largest share of women ministers in the region at 31.8 per cent, with the UAE following closely at 29 per cent. In the Pacific region, Palau gained two female ministers, and Tonga one. And the types of portfolios held by women ministers are shifting. Although women continue to mainly hold portfolios on Social Affairs – 109 out of 1412 portfolios – or Family/Children/Youth/Elderly/Disabled – 107 out of 1412 portfolios – the Trade/ Industry portfolio is among the top 5 ministries held by women for the first time, while the Women’s Affairs portfolio drops out. Also, for the first time since 2012, portfolios held by women ministers covering Employment/Labour/Vocational Training return to the top 5. And strikingly, more women are in charge of portfolios traditionally occupied by men than were in 2017; 30 per cent more women ministers cover Defence, 52.9 per cent more women Finance, and 13.6 per cent more women cover Foreign Affairs. But in Europe, Slovenia dropped the most percentage points since 2017 from 50 per cent to 25 per cent women ministers. Lithuania no longer has women in ministerial positions, compared to 2017 when there were three out of 14, or 21.4 per cent. In Asia, the share of women ministers in the Philippines decreased by 14.7 points to 10.3 per cent, and Japan lost two female ministers, leaving one woman out of 19 cabinet ministers, or 5.3 per cent. But the number of countries with no women ministers has decreased from 13 in 2017 to 11: Azerbaijan, Belize, Brunei Darussalam, Iraq, Kiribati, Lithuania, Papua New Guinea, Saint Vincent and the Grenadines, Saudi Arabia, Thailand and Vanuatu. UN Women’s Executive Director, Phumzile Mlambo-Ngcuka, said: “More women in politics leads to more inclusive decisions and can change people’s image of what a leader looks like. “We still have a steep road ahead, but the growing proportion of women ministers is encouraging, especially where we see a rise in the number of countries with gender-balanced ministerial cabinets. But, as the IPU’s President, Mexican MP Gabriela Cuevas Barron, said: “Equal representation in government positions is fundamental for a democracy to be truly representative and effective. “Despite some positive movement, the overwhelming majority of government leaders remain male. “It is a shared responsibility between men and women to change this and ensure gender equality at all political levels. To download a free copy of the map, click here.